……these are all questions I get on a daily basis. Now most of you will have heard of what workout finishers are, but for those of you that aren’t familiar with workout finishers here’s a quick definition for ya…. Now I say usually because let’s be fair they are called workout FINISHERS – however the beauty of these workouts is because they are so EFFECTIVE in burning fat, you can actually use them as stand-alone workouts. So if you’ve only got a few minutes to spare, or you want something to do on an off day – then workout finishers are perfect. ….Workout Finishers – of course! I liked the program so much I even wrote a review about it on FLC blog. There was always something missing from it. But I could never put my finger on what that ‘missing’ piece was. But still, with that said I always thought something could have been added to beef it up a little. And then along came Workout Finishers 2.0. …that missing piece was finally found. 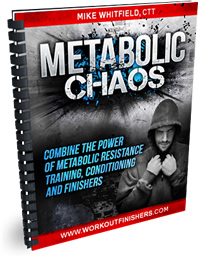 Metabolic Stacking is where 4 different variables are combined together to achieve the best possible results. If you’re serious about achieving your fat loss goals, and getting the best results possible, then Workout Finishers 2.0 is probably what you’ve been looking for. Take Care – Keep Focused – and use workout finishers to achieve a serious After Burn effect!